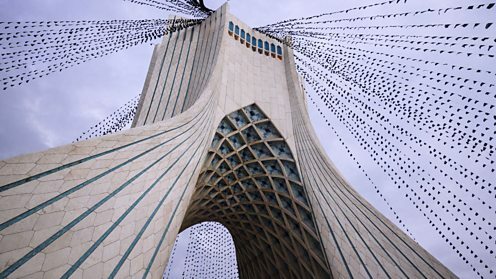 The Azadi Tower in Tehran hung with black flags for Ashura. At Ashura, Muslims remember the martyrdom of Hussain ibn Ali, grandson of the Prophet Muhammad, at the Battle of Karbala (AD680). Ashura is marked by all Muslims, but it’s most important for Shia Muslims for whom it’s a solemn day of mourning. Etrogs on display in the Mea Shearim district of Jerusalem. At Sukkot Jews remember the Israelites' 40 years of exile in the desert, living in makeshift dwellings, before they reached the promised land. For the duration of the festival Jewish families live in temporary huts called sukkot (singular: sukkah) which they build out of branches and leaves. 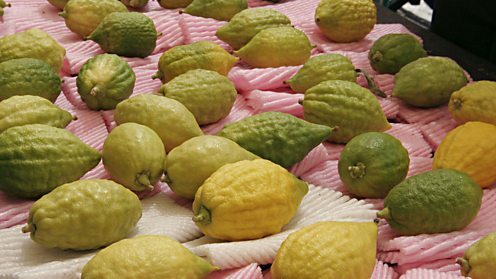 Each day they hold celebrations with four types of symbolic plants: palm, myrtle, willow and a special citrus fruit called an etrog. Sukkot is intended to be a joyful festival that lets Jews live close to nature and know that God is taking care of them. At Simchat Torah people dance in circuits with the Torah while singing its praises. Shemini Atzeret is a Jewish holiday marking the day after the end of Sukkot and is an extra day of celebration. Many religious Jews observe a rota of weekly readings from the Torah which allows them to read it through from Genesis to Deuteronomy on a yearly basis. 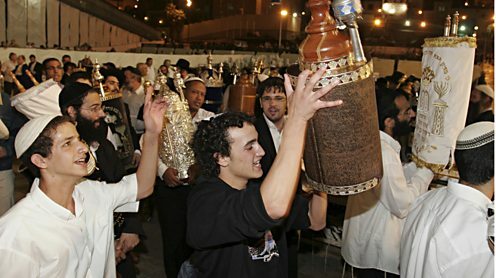 Simchat Torah means "Rejoicing in the Torah" and is the day when this annual cycle of rereading the Torah ends and starts anew. 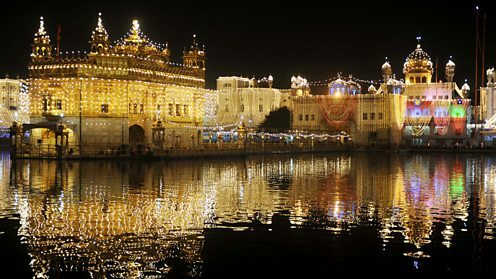 The Golden Temple at Amritsar lit up for Bandi Chhorh Divas. On this day Sikhs celebrate the safe return of the sixth Guru, Guru Hargobind, from detention in the Gwalior Gaol in 1619. 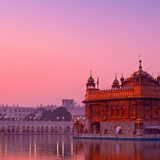 On the day of his return to Amritsar in 1619, Hindus were celebrating Diwali (the festival of lights) and the city was lit with thousands of candles and lamps. This has led to a similarity of celebrations between Sikhs and Hindus on this day although they are celebrating different events. Small earthen lamps are a feature of the home and temples during Diwali. 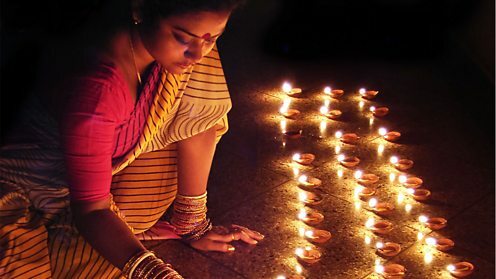 Diwali is known as the Festival of Lights and is celebrated by Hindus, Sikhs and Jains albeit for different reasons. For Hindus it's the most important annual festival when they celebrate New Year and give thanks to the Goddess of Wealth, Lakshmi. Sikhs celebrate the release from imprisonment of the sixth Guru Hargobind. For Jains, it's the day when, in 527BC, the sage Mahavira gave his last teachings and achieved ultimate liberation. 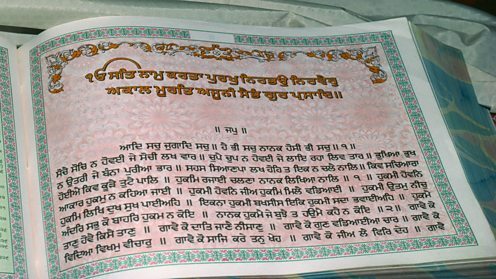 Pages from the Guru Granth Sahib. Guru Gobind Singh was the tenth and last living Guru of the Sikh faith. On his death in 1708 he said that Sikhs were to treat the Guru Granth Sahib (holy book) as their Guru for all times. The Guru Granth Sahib contains the words and writings of the founders of the Sikh faith (the Ten Gurus) as well as the words of various Hindu and Muslim saints. 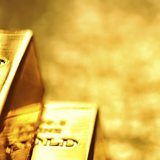 True wealth does not burn; it cannot be stolen by a thief. 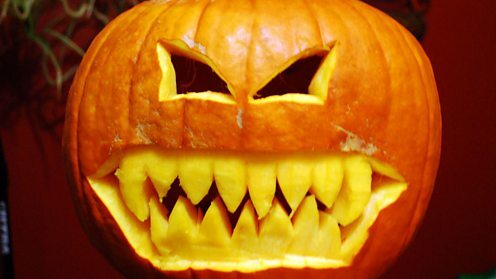 The Halloween Jack-o'-Lantern is thought to have orginated in ancient Celtic traditions where turnips or potatoes were hollowed out to make lamps. All Hallows' Eve is commonly known as Halloween - and means eve of All Saints' (or Hallows') Day. 'Hallow' is an old English word for saint. All Hallows' Eve marks the start of the season of Hallowtide, the time in the liturgical year when Christians remember the dead. Contemporary Halloween rituals are believed to have evolved from the Celtic festival, Samhain (see below), which was Christianised by the early Church. It is widely accepted that the early Church missionaries held a festival at this time of year to absorb native Pagan practices into Christianity, thereby smoothing the conversion process. Halloween: More than parties and pumpkins? 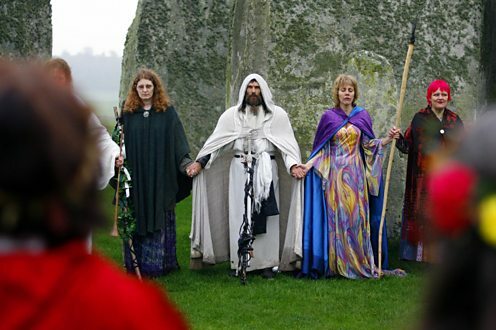 Druids performing a Samhain style blessing at Stonehenge, Wiltshire. Samhain marks the Celtic New Year and the beginning of what Pagans call the Wheel of the Year. Samhain has its origin in Pagan Celtic traditions. It was the time of year when the veil between the worlds of life and death was lifted and the spirits of the dead could mingle with the living. Loved ones who had recently died were remembered and their spirits often invited to join in the celebratory feast. To most modern Pagans, death is still the central theme of the festival but this doesn't mean it’s a morbid event. For Pagans, death is part of the natural life cycle and not to be feared. 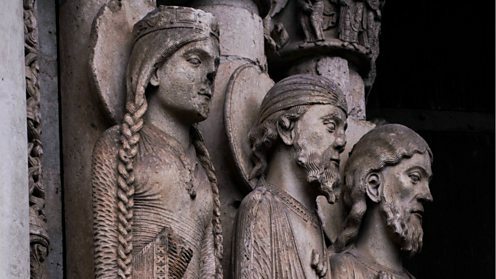 Saints welcoming sinners into Chartres Cathedral, France. On All Saints' Day Christians remember all the saints and martyrs, known and unknown, throughout Christian history. Remembering the saints and dedicating a specific day to them each year has been a Christian tradition since the 4th Century, but in AD609 Pope Boniface IV decided to include all martyrs as well. Originally 13 May was designated, but in AD837 Pope Gregory IV changed the date to 1 November. Decorative skull sculptures for the Day of the Dead Festival. All Souls' Day is a day when Christians remember and pray for the dead, especially family members. 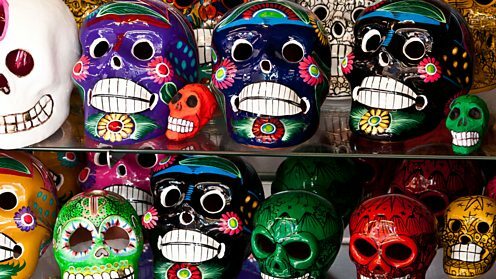 On 1 and 2 November, Mexicans around the world celebrate the Day of the Dead (Dia de Muertos) when they pay tribute to friends and family who've died. Guru Nanak (1469-1539), the founder of modern Sikhism. 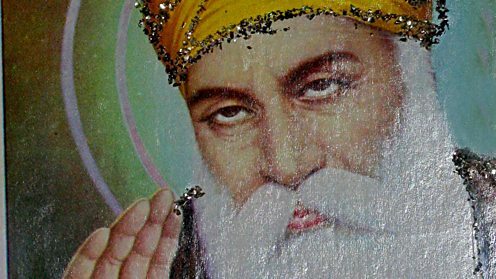 Guru Nanek was the founder of the Sikh faith and the first of its 10 Gurus. He was born in the Punjab in 1469. 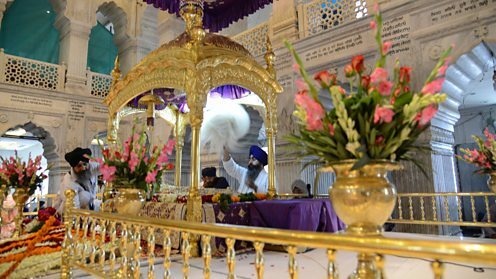 Sikhs celebrate with prayers, the singing of religious songs and readings from the Guru Granth Sahib (Holy Book). Free sweets and community meals are offered to everyone at the temples. Houses and temples are lit up for the festivities. The Dome of the Shrine of the Báb, Haifa, Israel. On this day Bahá'ís celebrate the birth in 1819 of the Báb, the herald or forerunner of their faith. This is one of the nine holy days of the year when work is suspended. 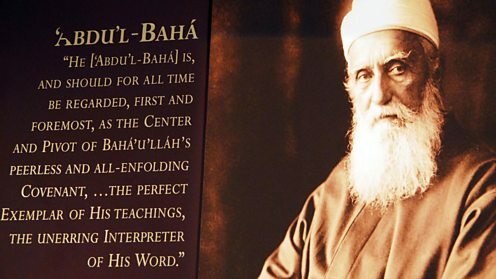 Upon his death Bahá'u'lláh's son, 'Abdu'l Bahá, was named the infallible interpreter of Bahá'u'lláh's message. On this day Bahá'ís celebrate the anniversary of the birth in 1817 of Bahá'u'lláh, the founder of their faith. Bahá'u'lláh means 'Glory of God'. 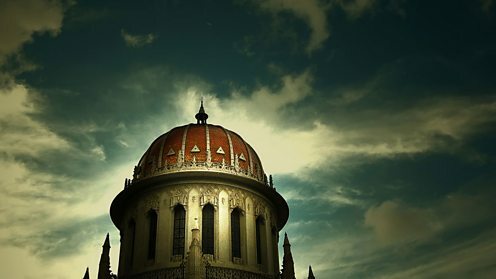 Bahá'u'lláh gave up his privileged life to follow the Báb, the herald of the Bahá'í faith. After the death of the Báb, he became the movement's leader and laid down the laws and principles of the Bahá'í faith. His birthday is one of the nine holy days of the year when work is suspended. The interior of the Sikh temple, Gurdwara Sis Ganj Sahib, in New Delhi, said to have been built on the site where Guru Tegh Bahadur was martyred. Guru Tegh Bahadur was the ninth of the Ten Sikh Gurus. He was martyred in 1675. Among Guru Tegh Bahadur's achievements was the building of the city of Anandpur Sahib, now known by Sikhs as the 'City of Spiritual Bliss'. He was arrested and executed in 1675 on the orders of the Mughal Emperor, Aurangzeb, who tried to impose Islam on Indian Hindus and Sikhs. 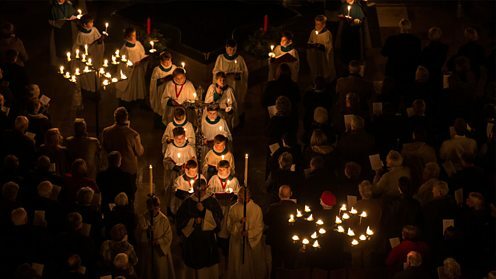 The Darkness to Light Advent Procession at Salisbury Cathedral begins with the cathedral in total darkness, and ends with it lit by 1300 candles. Advent is the four week period before Christmas when Christians prepare for the coming of Christ. The word Advent means 'coming' or 'arrival'. 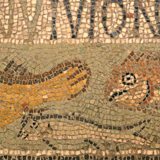 Advent begins on the fourth Sunday before Christmas, which also marks the beginning of the liturgical year for Western Churches. 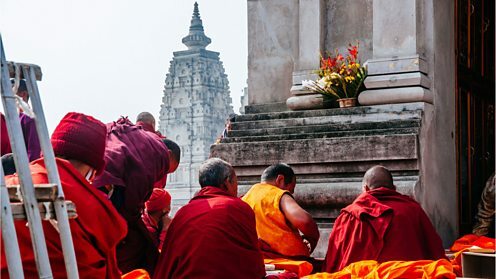 Buddhist monks praying at Mahabodhi temple in Bodhgaya, India, which is said to mark the spot where the Buddha achieved enlightenment. On Bodhi day Buddhists from the Mahayana tradition celebrate the Buddha's attainment of enlightenment. The tradition is that having spent six years living an extreme ascetic life, the Buddha formulated his 'middle way' philosophy. He then spent time in deep meditation under the Bodhi Tree at Bodhgaya, India, where he achieved enlightenment and realised the Four Noble Truths. 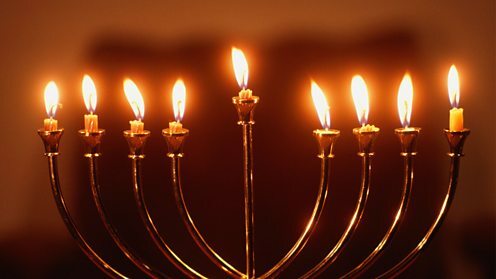 The ninth candle in the menorah is for lighting the other eight on the consecutive days of Hanukkah. Hanukkah is a Jewish festival also known as the festival of lights. 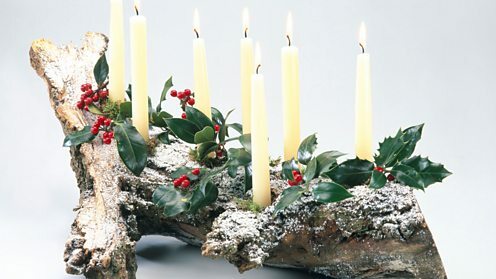 The Yule log has its origins in Pagan times when it was the highlight of Winter Solstice celebrations. Yule marks the Winter Solstice - the shortest day of the year - when Pagans celebrate the rebirth of the sun. The lives of the ancient Celtic people were strongly influenced by the seasons and the Earth's position with regard to the sun. The sun was vital for the cycle of life and was worshipped as a god. After the Winter Solstice, days start to lengthen and Pagans would celebrate the return of new life. Christmas Eve is the evening before Christmas Day. Christmas celebrations traditionally start on Christmas Eve with Midnight Mass. Christian tradition holds that Jesus was born at night and Midnight Mass is a commemoration of his birth. A nativity scene showing the shepherds who, according to the New Testament, visited the infant Jesus at his birth. 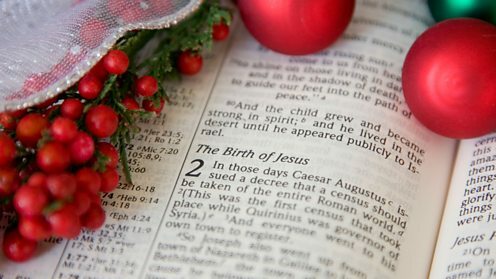 Jesus's birth, known as the nativity, is described in the New Testament of the Bible. 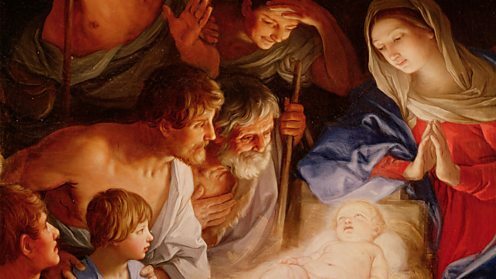 According to tradition, Joseph and Mary travelled to Bethlehem shortly before Jesus's birth, as the Roman Emperor had ordered a census of the Jewish people, and all had to return to their place of birth. When they arrived in Bethlehem the inns were already full, but an innkeeper allowed them to stay in a cave which he used for his animals. It was here that Mary gave birth to Jesus and laid him in a manger. 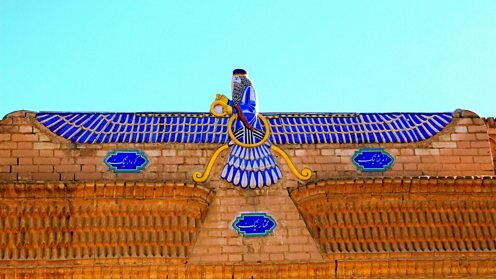 The Faravahar symbol, the symbol of Zoroastrianism, over a Fire Temple in Yazd, Iran. On this day Zoroastrians remember the death of their prophet, Zoroaster. It's a solemn occasion devoted to prayer and remembering his life. Zoroastrianism is one of the oldest monotheistic religions and was founded by the Prophet Zoroaster about 3,500 years ago. For 1000 years Zoroastrianism was one of the most powerful religions in the world and was the official religion of Persia (Iran) from 600BC to 650AD. It is now one of the world's smallest religions, estimated to have fewer than 190,000 followers worldwide.